I am in dire need of recommendations for a good value-for-money facial cleanser. The current one that sits on my vanity top is Avene’s Gentle Gel Cleanser and I have not been satisfied with its performance on my skin. The bottle proclaims it suitable for normal to combination sensitive skin but it has been giving me acne breakouts. My skin is quite resilient to most products and I seldom get acne so if this cleanser has this effect on me, I cannot imagine what it will do for those with ultra-sensitive skin. I was told that for maximum benefit, one should not stick loyally to one facial product for too long but switch after a season. So since my teenage years, I have been trying a succession of brands ranging from salon brands and the more expensive ones like Clinique and Clarins, to the cheaper over-the-counter pharmacy types like Biore and Neutrogena. Effectiveness and satisfaction varies from brand to brand and product to product. Being impartial to established brands, I am just as game to try other cheaper brands/products as long as they prove to be effective. 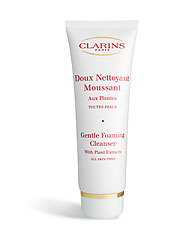 However, for the moment, I am sorely tempted to go back to Clarins for their Gentle Foaming Cleanser for All Skin Types.